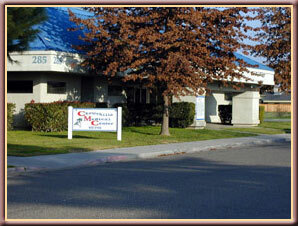 EASY TO FIND: We are located in the Chowchilla Medical Center. Our entrance is at the back of The building. The sign Chowchilla Physical Therapy is next ' our door. There is a ramp up to our door for easy wheelchair access. From Robertson Blvd. Heading East: Turn left onto 11th. Turn left onto Ventura. Cross Ventura onto Hospital Drive. Turn left into the first driveway. Drive to the back of Chowchilla Medical Center. From 99 North: Take the Robertson exit. Turn left at the stop sign. Continue on Robertson to the second stop light, 5th St. Turn right onto 5th St. Proceed to the stop sign at Ventura. Turn left on Ventura. Proceed to Hospital Dr. Turn right onto Hospital Dr. Turn left into the first driveway. Drive to the back of Chowchilla Medical Center.